When choosing which company to buy your emergency food from, it’s important to review each of the best to see how they stack up against the competition. There are several factors to consider when deciding which emergency food company fills your needs the best. Some examples of this are the quality of their food, the shelf life of the food, the variety of food choices available, and the cost. Another thing to consider is that some of these companies only offer emergency food, and very little or none of anything else like emergency supplies and survival gear. Maybe you’ll need to purchase your food storage from one of these companies and your emergency supplies from another. Several of the these top 5 offer both, you’ll just need to see which of them will best fit your needs. 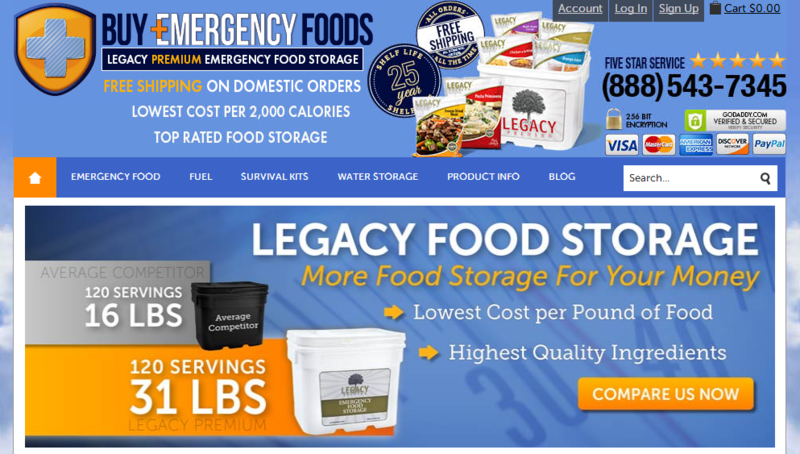 We’ve recently updated this page to include only the top 2 websites to buy emergency foods. In testing some of the products from the other companies previously listed, we had some issues with not only the products, but the entire ordering process. Frankly we want to recommend only the best websites to by emergency food supplies to our visitors, so we decided to narrow down our top 5 list to only include only the top 2 sites. The good thing is between these 2 websites you can order pretty much anything to meet your emergency needs. Whether you need emergency food, specific food such as gluten free, storage supplies, water or even fuel, you can find it at one of the 2 sites listed below. 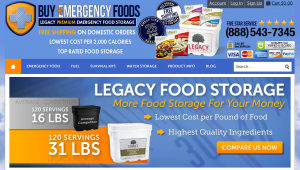 Buy Emergency Foods is our top contender for the title of the “Best Emergency Food Company”. They sell food manufactured by “Legacy Premium” which is high quality and voted best tasting food by consumers. From emergency food to water storage and treatment, fuel sources and survival supplies, this company can get you started on the right track whether you’re an experienced “prepper” or just trying to get started protecting your loved ones. They also include some nice specialty items that other brands don’t consider, such as dried honey powder, dried chopped onions, dried cheese powder and a nice range of dehydrated dairy products that actually taste great. These kinds of extras can make surviving an emergency a lot more tasty. With a long shelf life and free shipping on all orders, Buy Emergency Foods is definitely an industry leader. If you’d like to read a detailed review of this brand, then visit this Buy Emergency Foods review. 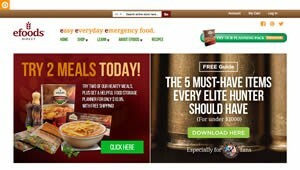 Visit Buy Emergency Food NOW! 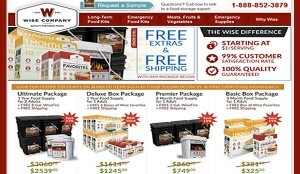 Wise Food Storage also makes it on my reviews list as one of the best emergency food companies out there. They constantly get 5 star ratings from preppers and survival enthusiasts. Wise offers a huge selection of emergency food items,, including products that meet the needs of individuals who are subject to dietary restrictions. Their freeze dried and dehydrated products are incredibly easy to prepare and taste better than many of options available from other brands. I personally don’t think Wise food tastes quite as good as the options available at Buy Emergency Foods – but that is a matter of personal preference. Many emergency preparedness aficionados that I know have selected Wise Food Storage as their brand of choice for securing their emergency food supply. They boast a 99% customer satisfaction rate and their prices start at just $1 per serving. Visit Wise Food Storage NOW! The Ready Store guarantees that no food items or survival products are outsourced from China. They have a price match guarantee, meaning you will never pay more than the lowest possible price for quality emergency food and disaster preparedness survival gear. Dairy, dehydrated and freeze-dried products are the focus of the company. But shelter, fire, water and other survival products are available. Shipping charges are affordable, and the special Clearance Section and Daily Deal area should be checked every day so you do not miss out on an a time-limited money saving special. A true “get everything in one place” survival and prepper website. Visit The Ready Store NOW! My Patriot Supply believes everyone should be self-reliant. The company’s focus is on supplying high quality survival and emergency preparedness products that anyone can afford, backed by excellent customer service. They are consistently successful on both counts. 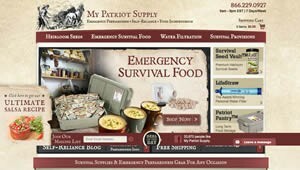 That is why My Patriot Supply is often mentioned as one of the top emergency food suppliers on the Internet. Heirloom seeds, emergency survival food, water filtration, and items like a 4-in-1 hand crank LED flashlight/radio and a cooking stove in a can are just some of the offerings you will find on the company’s easy to use website. Their free Self-Reliance Blog provides applicable news updates and disaster preparedness how-to information. A 45 day, no questions asked return policy and free shipping on all orders over $49 are just a couple of the attractive qualities that this leading emergency food supplier delivers. Visit My Patriot Supply NOW! The Food Insurance company was formed in 2009 as a sister company to Daily Bread. Headquartered in Kaysville, Utah, the web-based operation is known for offering high quality, good tasting emergency food products at affordable prices. With TV and radio personality and author Sean Hannity’s full endorsement, Food Insurance offers “pay as you go” and “build your own” plans that allow customization and layaway-like affordability. The company only sources food production from quality, trusted manufacturers, and offers dehydrated and freeze-dried food products, water storage and emergency supplies, emergency cooking stoves and ovens, bug out bags and backpacks. 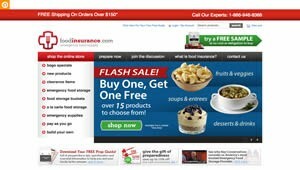 Their free blog is always informative and they frequently offer Buy One, Get One Free specials (BOGOs). The Food Insurance Preparedness Club provides free samples, offers Refer-a-Friend rewards and membership special pricing, and is absolutely free to join. Nitro-Pak provides free shipping on all orders over $149. Orders totaling less than that are a very affordable $9.50, and the company’s DEALS section offers some real value on quality survival food and gear. Free bonus products are offered on special purchases. You always enjoy a 110% price guarantee, and in addition to food, water and survival products, long-term storage ice cream is even available! This is a great place to pick up emergency fuel and cooking stoves as well. 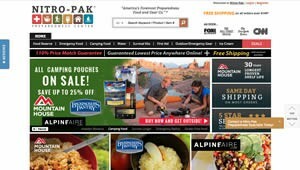 Nitro-Pak lists Mountain House emergency food products among its many offerings, meaning the longest shelf life available for any emergency food offered online (30 years). Now that you have read the best emergency food company reviews, you should have a better idea of what each of these companies can offer you and your family. Within these top rated companies, you have access to pretty much any emergency or survival product that you’ll need to survive whatever situation comes your way. Whether it’s a natural disaster like tornadoes or hurricanes, something like an economic collapse or grid failures, or even the dreaded zombie apocalypse, you need to be prepared for the worst. With just a couple clicks of the mouse, you can gain piece of mind knowing that you’ve taken critical steps towards the survival of your loved ones. Don’t get caught unprepared, do something today!